FILE - Demonstrators hold banners with the picture of Erol Onderoglu, local representative of Reporters Without Borders, during a protest against the arrest of three prominent activists for press freedom, in front of Metris prison in Istanbul, Turkey, June 24, 2016. 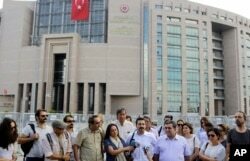 Journalists gather outside a court building in Istanbul, Turkey, to support their colleague Bulent Mumay, who was detained in connection with the investigation of the failed coup attempt, July 27, 2016. FILE - Turkey's President Recep Tayyip Erdogan addresses his supporters in Ankara, Turkey, Thursday, May 12, 2016. CPJ branded Turkey the leading jailer of journalists in the world for the second year in a row in 2013. Though Turkey released dozens of journalists the following year under international pressure, it “increased its repressive action against the press,” Ognianova told a House subcommittee hearing on "Turkey’s Democratic Decline” two days before the July 15 coup attempt. “There has been a systematic persecution that has been going on for months, and that is part of a large crackdown on critical voices in Turkey,” Ognianova said. “Those include journalists who reported on issues such as high-level corruption, the conflict in the southeast between [Kurdish militant group] PKK and security forces, the refugee crisis and the war in Syria." FILE - A woman walks past a banner picturing Turkish President Recep Tayyip Erdogan that reads, "When you arrest (journalists) or censor (media) we know that you are a war criminal, Tayyip," during a protest over the arrest of journalists Can Dundar and Erdem Gul in Ankara, Turkey, November 27, 2015.